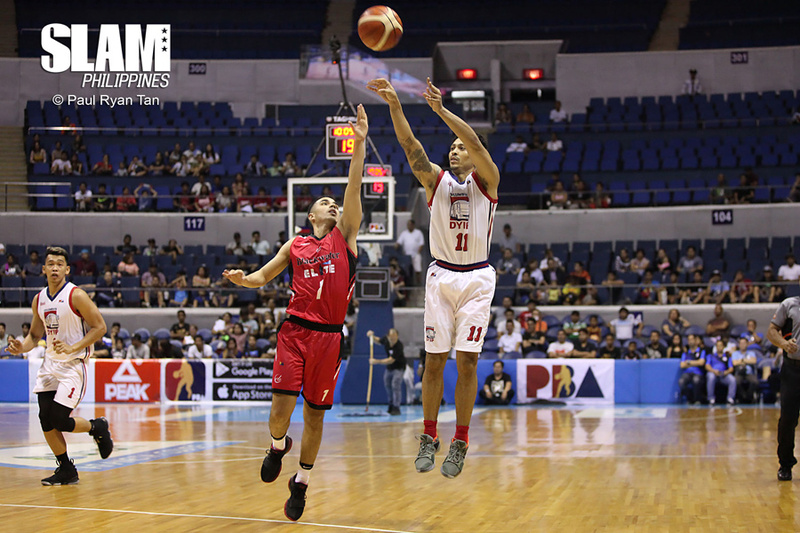 Boosted by the all around play of guards Jerramy King and Rashawn McCarthy, the Columbian Dyip dispatched Blackwater Elite easily to open the PBA Commissioner’s Cup with a win. King was acquired by Columbian from the free agent market during the break. He teamed up with the breakout star of the Philippine Cup, McCarthy to power the Dyip in the second half of the game. Columbian held a slim lead over Blackwater heading into the halftime break. The Dyip used their pressure defense to force several turnovers. That led to repeated fast break attacks from the guard corps of the Dyip. The four-point lead ballooned to as much as 35 points in the third quarter. Blackwater tried to come back in the fourth quarter behind the inside-outside attack of Jarrid Famous and Allein Maliksi. They were able to cut down the deficit to just 11 points. But the Dyip’s momentum couldn’t be stopped. Columbian finished the game with a 34-15 blast to pull away and take the win. King finished with 30 points, seven rebounds and three steals. McCarthy had 22 points and six assists. Lastimosa, Camson and Tubid all finished in double figures, combining for 38 points. Columbian had 22 steal in the game, the second-most in PBA history. The new-look TNT KaTropa used a balanced scoring attack to open the new conference with a win over the GlobalPort Batang Pier. Terrence Romeo acquired from the Batang Pier during the break in between conferences started the game and immediately made an impact. He scored six straight points in the fourth quarter to push TNT ahead in the fourth quarter. That was part of a 16-4 run that extended a two-point lead to a double-digit cushion. Romeo provided the finishing kick but it was Jayson Castro that did the heavy lifting. Castro had a big double-double with 21 points and 10 assists. He repeatedly found creases in the GlobalPort defense to score and create for his big men and shooters. 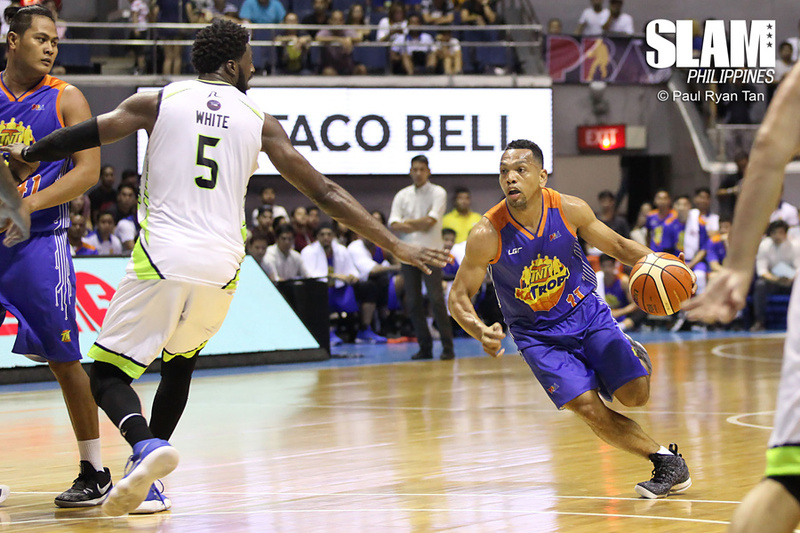 The game got chippy in the fourth quarter and the Batang Pier lost key players at a crucial point in the game. Mo Tautuaa kicked TNT’s import Jeremy Tyler in the chest after a dunk. That resulted in his ejection. That move was followed by an unsportsmanlike foul on Joseph Gabayni, the secondary big man of GlobalPort. Because of all those infractions, TNT was able to hold on to their lead because of free throws and return possessions. A whopping nine players scored in double figures for TNT. Castro led the team in scoring. But he got a ton of help from RR Pogoy who finished with 20 and Jericho Cruz with 16. Tyler finished with 14 points and 12 rebounds. Romeo scored 11 in his first game for TNT.